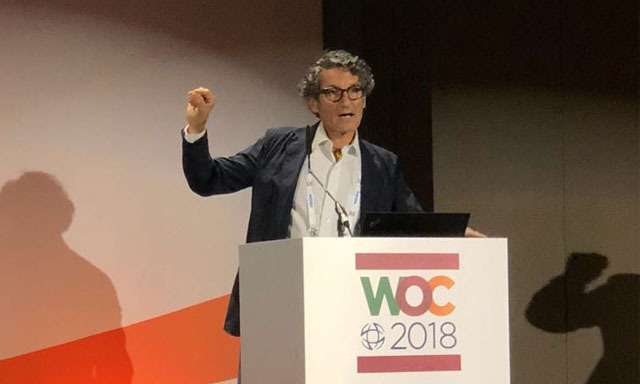 Dr. Jordi Monés, MD, PhD, the Director del Institut de la Màcula and a renowned figure in the field of macular degeneration, has addressed the latest developments in the field of vision at the 36th World Ophthalmology Congress, held in Barcelona on 16-19 June. Dr. Monés, as a member of the American Society of Retina Specialists (ASRS), explained that “therapies with stem cells lie at the heart of important lines of research for the treatment of atrophic AMD together with the gene therapy that should enable the affected gene to be replaced". The atrophic type is the most widespread, representing 85% of cases of macular degeneration. According to the progress made so far, it is expected that these treatments may have a clinical application in ten years’ time. Specifically, in the context of neovascular macular degeneration, Novartis presented some months ago the results after one year of a prespecified secondary analysis of the phase III clinical trials, 'Hawk' and 'Harrier', which compared brolucizumab 6 mg (RTH258) with aflibercept 3 mg. Dr. Monés, who took part in this research, presented at the international congress the impact of baseline characteristics on the q12 status at week 48 and in the predictive value of the first 12 week cycle. The study results showed that approximately 85% of the patients assessed as appropriate for a 12-week treatment frequency with brolucizumab during the first 12-week cycle after loading could reliably stay on that quarterly interval up to week 48. This finding can give doctors the confidence that when the 12-week administration with brolucizumab is initially satisfactory, there is a high probability that the patient will be able to maintain this interval during the first year of treatment. This would mean a reduction in the need for regular visits, functional examinations, imaging tests and intravitreal injections. In addition, Dr. Marta Pazos, MD, PhD, an ophthalmologist and glaucoma specialist, was invited to a session organised by Heidelberg. Dr Pazos spoke about the multifactorial holistic diagnosis of glaucoma with OCT and offered a variety of tips for conducting a full analysis of the nerve.